Beautiful Berchtesgaden. Things to do in the area & how to get around. 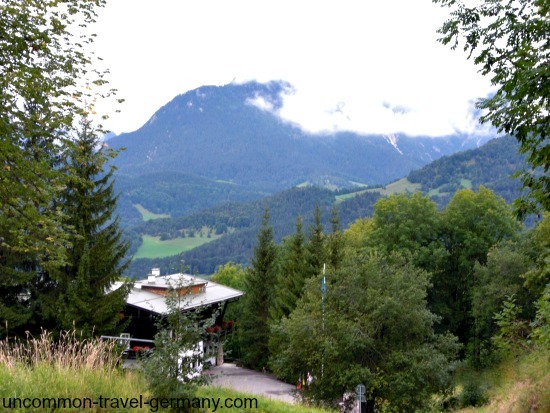 Things to do and see in Berchtesgaden and the surrounding area, Berchtesgadener Land. Explore this charming little mountain town, along with the remains of the Nazi stronghold on the Obersalzberg, the Eagle's Nest and Hitler's Berghof. Sail on the Königssee, hike the alpine meadows, tour the salt mine and visit the local hofbräuhaus. The town lies in an area known as the Berchtesgadener Land, a little peninsula of Germany inserted into the Austrian alps near Salzburg. This remote southeastern tip of Germany has been a separate country for most of its history, ruled by a church-provost and later a prince, and was added to the kingdom of Bavaria in the 19th century. The town of Berchtesgaden sits in one of the most spectacular natural settings in the world. 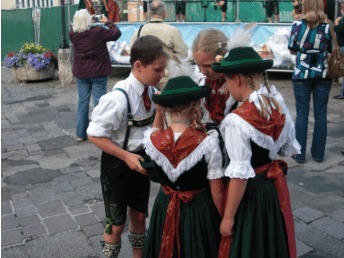 The narrow, winding streets are lined with pastel houses in the alpine style, and locals entertain the visitors with Bavarian music and dance. 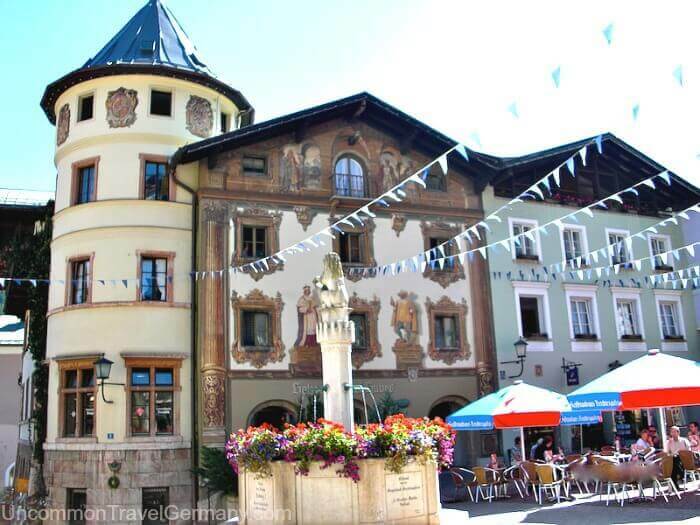 If you can only visit one German alpine town, pick this one! For more things to see and do in the town, see Berchtesgaden. Tour the salt mine. This is really fun. You can put on a miner's outfit and tour the salt mine that brought prosperity to medieval Berchtesgaden. Go deep into the mine and be ferried across an underground lake. Very cool. For more info and how to get there, see salt mine tours. There are lots of hotels, pensions and B&B's to choose from; this has been a tourist town since the medieval pilgrims came this way. Here are a few Berchtesgaden hotels that I recommend. 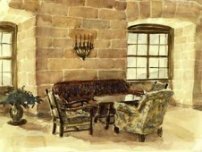 My favorite is the Hotel zum Türken, a wartime survivor with a charmingly old-fashioned atmosphere and a fascinating history. For an enchanting alpine lake experience, go sailing on the magnificent Königssee, Germany's deepest and cleanest lake, in the Berchtesgaden National Park, just 5 miles south of the town. Hitler's mountaintop tea house is now a restaurant sitting above the clouds, with incredible views of the Bavarian and Austrian Alps. 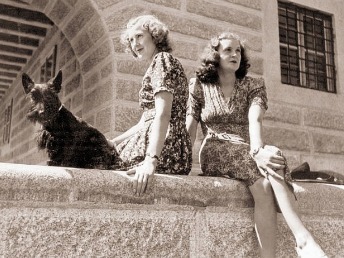 Get tips for visiting the Eagle's Nest and info about its history. 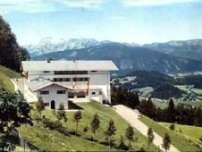 Explore the former southern headquarters of the Third Reich, up on the Obersalzberg, a hill just above the town. The Documentation Center is an interesting museum about the National Socialist period and you can climb around in two of the WW2 bunkers open to the public- pretty spooky. The ruins of Hitler's Berghof are next door to the Hotel zum Türken, one of the few original buildings remaining. Read about the history of the Obersalzberg. Hiking: this is a superb area for walking; the Germans love to wander in the out-of-doors, so there are well-marked trails for every level of fitness and duration, and the alpine scenery can't be beat. Check in with the Tourist Office across from the Hauptbahnhof for trail maps. 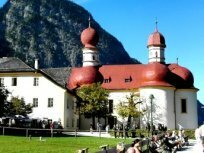 Suggested hike: take bus #846 from in front of the Berchtesgaden train station to Ramsau, famous for it's pretty and much-photographed Baroque church. 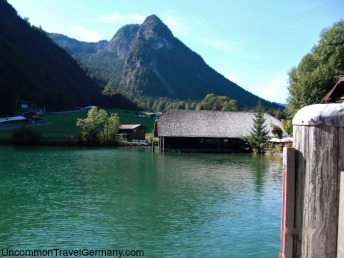 Walk from Ramsau to the Hintersee, an alpine lake with a level path all the way around it. Absolutely gorgeous! Takes three hours and the way is well-marked; follow the stream that goes by the church. Joseph Mohr, the priest who wrote the lyrics to the Christmas carol, Silent Night, served at this church briefly. General Eisenhower was so impressed he did an oil painting of this scene after the war. For a shorter, easier version, take the bus to Ramsau, stop and see the church, then catch the same bus to the Hintersee and walk around it. The path around the lake is level and takes about an hour. Skiing: the surrounding mountains have a number of popular ski areas. I haven't been here in the winter, but it should be just as charming, and much less crowded (75% of the tourists come in July and August). 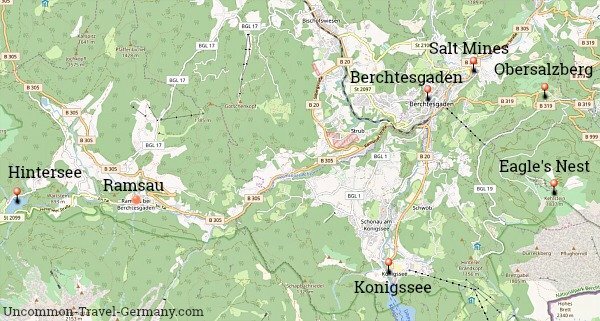 Some information on Berchtesgaden ski areas. Swimming: There is a huge swimming complex just down the main road from the town called Watzmann Therme, open to the public. Warm pools, salt pools, water slides, etc., on Highway B305 (Bahnhofstrasse). Sledding: There are toboggan runs (where you can rent sleds) in winter and metal chutes with rolling sleds to ride on in summer. I haven't tried it, but it looks like fun. More info at: Obersalzberg summer sledding, or winter toboggan run. The main bus station in Berchtesgaden is just in front of the Hauptbahnhof. The buses pull in there at two stops, and the bus schedules are posted at the stops. 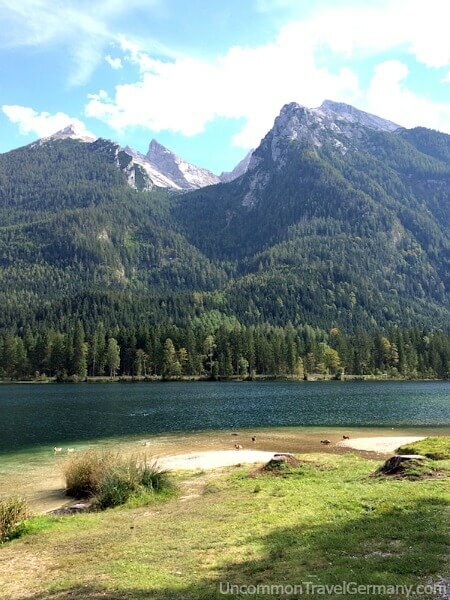 From there, you can get buses to the Obersalzberg (#838) where the Eagle's Nest buses leave from, to Lake Königssee (#841 & 842), Ramsau & Hintersee (#846), and the salt mines (#848). 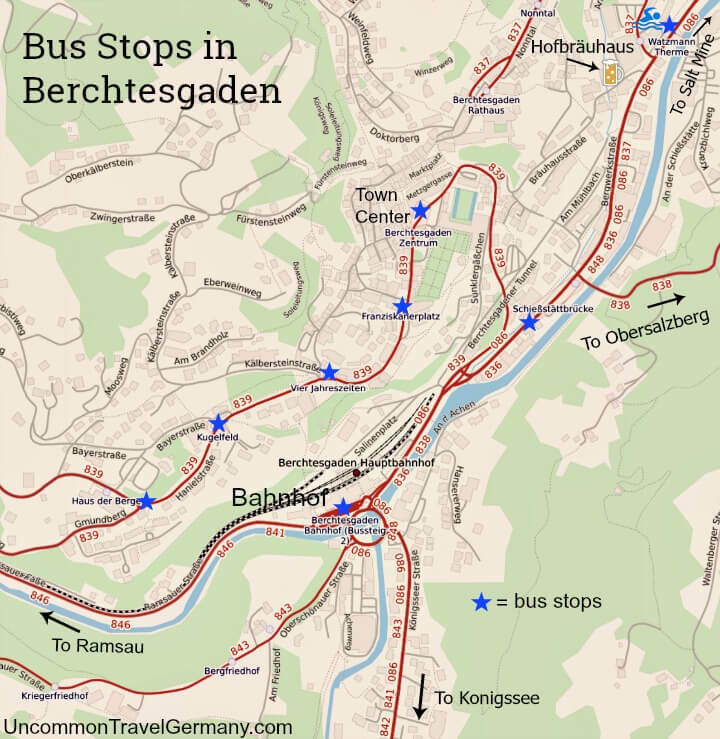 Good to know: you can pick up bus #839 at multiple stops in the town of Berchtesgaden. From there, you can take that bus down to the Hauptbahnhof to catch the other buses. Each time you get on a bus, you have to buy a ticket; good reason to use one of the passes described below! Something I found very useful: I purchased the booklet that contains all the local bus schedules. It's for sale for a small fee at the Tourist Information Center across from the train station. They'll print out individual bus schedules for you for free, but I liked having the whole collection for trip planning. The Berchtesgaden area has an excellent network of buses and trains for traveling in the area, plus some handy tickets for saving money. Hotel passes. Most of the hotels in Berchtesgaden will give you a bus pass after you check in that gives you free rides on all the local buses while you're staying at the hotel. Tages-Ticket. For 10.40 Euros, you can get a Day Ticket that gives you unlimited rides on the local buses as well as the bus or train to Salzburg. Plus discounts on lots of local attractions. Bayern-Ticket. This is a train ticket that covers all trains (except the fast, intercity ICE trains) in Bavaria for the day. Groups of up to 5 people can travel on one ticket. Tip: if you plan on doing some exploring in Berchtesgaden using buses while you're here (like Königssee, Ramsau, Obersalzberg, etc.) you can save money by getting an RVO Day Ticket (aka Tages-Ticket). The Tages-Ticket gives you unlimited transport on the local buses (but not the special Eagle's Nest buses), as well as paying for a bus ride to Salzburg. It's 10.40 Euros per adult ticket, with discounts for children and families. It also covers travel on trains and buses between Salzburg and Berchtesgaden. This ticket gives holders 10% discounts on some popular attractions, like the Eagle's Nest bus, Königssee boat cruise, Jennerbahn gondola, and the salt mine tour. You can get the Day Ticket online, on the buses (including the bus #840 in Salzburg), from ticket machines, and at the Berchtesgaden and Salzburg Hauptbahnhofs. The Bayern-Ticket, or Bavaria ticket, allows unlimited train travel through Bavaria. Up to five people can ride on one ticket (the more people, the less per person). This can save money if you plan to take more than one train trip in a day, as in there-and-back, as well as for larger distances within the area. See Bayern ticket for more info. There's no need to book this in advance because you're not limited to any particular train or time, just the day you choose. Online tickets. If you buy the tickets online, you can either print them out or use your mobile phone to show the ticket to the conductor. 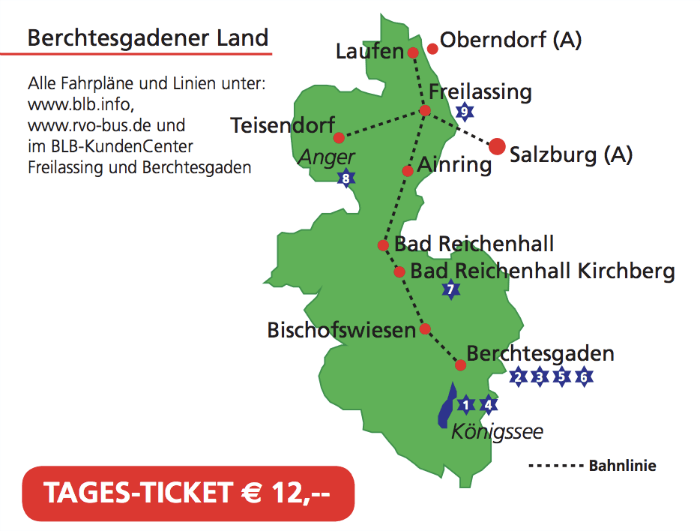 There's a couple of tours leaving from Salzburg that combine Berchtesgaden with a number of other places of interest. 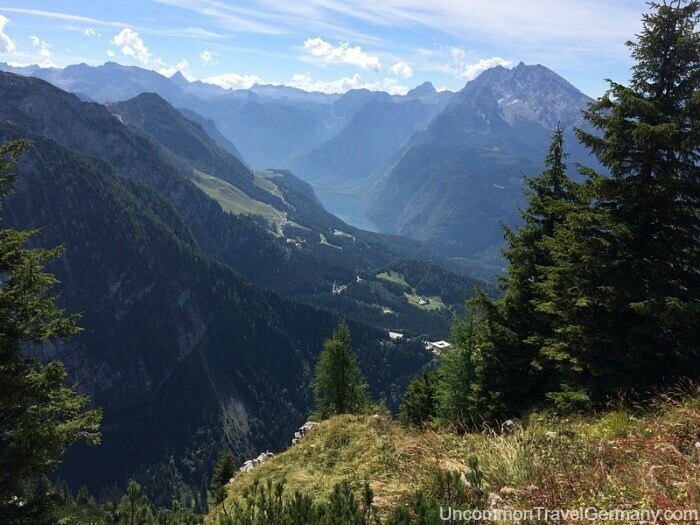 Visit the Eagle's Nest, Berchtesgaden, the salt mines, and Lake Königssee, all in one day. $114. See Eagle's Nest/Salt Mines tour for info and booking. See the Eagle's Nest, Berchtesgaden, Hitler's Berhof ruins, Hotel zum Türken bunkers, Ramsau church, and Lake Hintersee, also in one day. $112. Go to Eagle's Nest/Ramsau tour for more info and booking. I highly recommend Eagle's Nest Historical tours to anyone who has an interest in the World War 2 history of this area. I went on this tour years ago and was very impressed with the knowledge that David Harper has about this period. 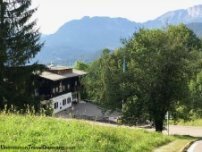 If you want an articulate expert to show you the sites associated with the Third Reich, as well take you up to the Eagle's Nest, contact David and his wife Christine at Eagle's Nest Historical Tours. 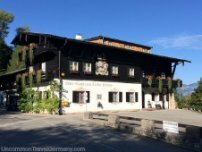 They stop at the Documentation Center, a Third Reich Museum, on the Obersalzberg, go through the bunkers there, and drive to some other interesting historical locations, before going with you up to the Eagle's Nest. Their office is in the Berchtesgaden Tourism Office across from the train station, and the tours leave from there. Salzburg, Austria, is only 12 miles from Berchtesgaden. If you haven't been to Salzburg, I strongly suggest fitting it in, since it's so convenient to get to from here. You can get there yourself easily on the bus without a tour, also. The Watzmann Express, #840, leaves about hourly from the Hauptbahnhof. In Salzburg, there's a 2.5-hour walking tour of the old city, hitting some hot spots like Mozart's birthplace and the do-re-mi stairs from the Sound of Music, as well as the Salzburg cathedral. $51.88. See Salzburg Historical Tour for more info and booking. For a real treat, hear a concert of Mozart's music in his own city, in Salzburg's medieval fortress above the town. $50.73. See Mozart concert in the castle for info and booking. 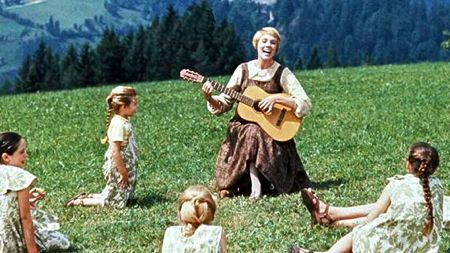 If you're one of those who can't get enough of the Sound of Music, there are tours that take you around to most of the locations where the scenes were filmed, while filling you in on the history of the making of the film and some juicy, behind-the-scenes gossip. The locations are scattered around Salzburg and the surrounding countryside, so it's not really practical to track them down yourself and figure out how to get there. I went on a Sound of Music tour years ago and it was great fun! Most of the tours start in Salzburg, but it's easy to get to from Berchtesgaden (Bus #840 leaves for Salzburg every hour from the main train station in Berchtesgaden). From Salzburg: this highly-rated, four-hour tour picks you up in Salzburg and takes you to many of the settings used in the movie. Hear the behind-the-scenes scoop and sing along! $51.88. See Sound of Music Tour for more info and booking. Also from Salzburg: a combination Salzburg and Sound of Music Tour. Do both: a two-hour, walking tour of Salzburg, in the footsteps of Mozart and more, then a four-hour bus tour to visit the Sound of Music film locations. $71.04. See Salzburg & Sound of Music Tour for more info and booking. 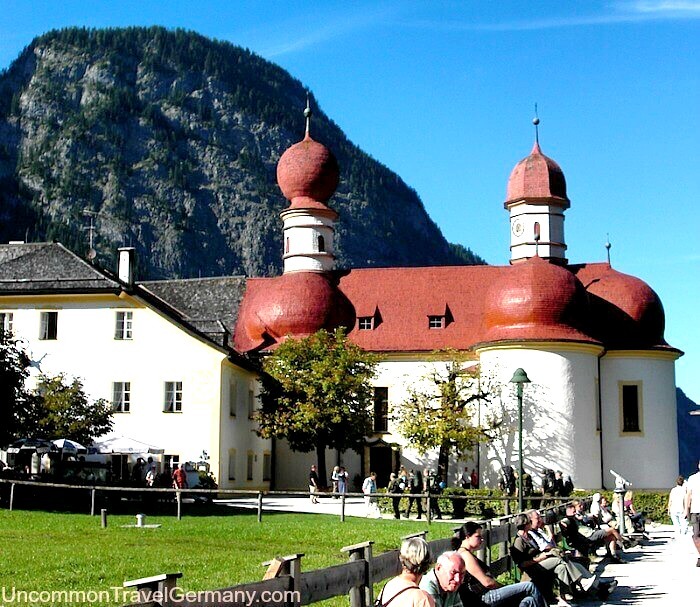 Sound of Music, Berchtesgaden & the Salt Mines. If you're staying in Salzburg, you can do the Sound of Music tour, the salt mine tour, and spend some time exploring Berchtesgaden. $98. 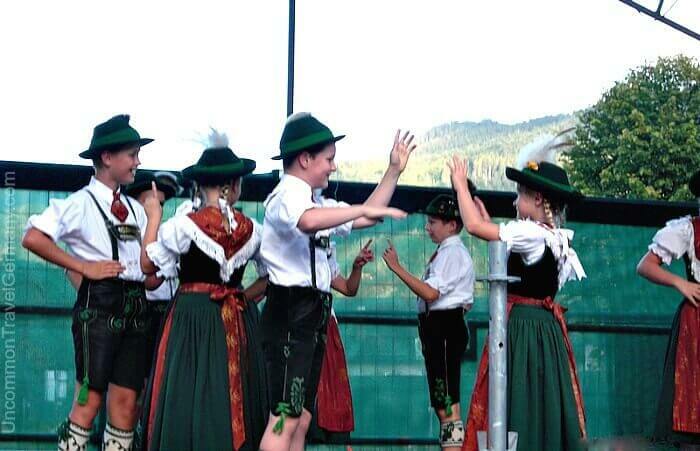 See Sound of Music, Salt Mine, & Berchtesgaden tour for info and booking. 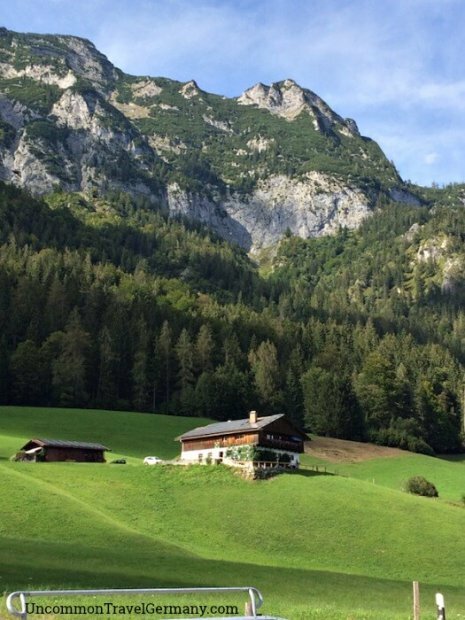 From Berchtesgaden: you can also book a Sound of Music via Eagle's Nest Tours in Berchtesgaden (this is a private tour with group rates).